You will receive One-RED and One-BLACK Tray per each Lot Set of 2. Adds a little bite to your drinks! So drop some stone-cold fangs into your Bloody Mary and feel that chill go right down your spine. Mwahahaha! As twilight descends and drinks are poured, add bite to your beverage with the Cold Blooded Vampire ice cubes. Perfect for Bloody Mary and other spine-tingling drinks fit for the vampire lovers in your family. It'll make you try to remember what it was like Being Human! Each ice tray yields 5 fangs - be sure to get enough for everyone! The biggest complaint with vampires is that human blood is simply too warm to drink, so they like to properly chill it down with ice cubes made from this set of cool new bloody cold Vampire Teeth Ice Cube Trays. 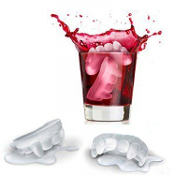 If you haven't been bitten yet, then this unique, coffin-shaped, silicone tray will produce vampire fang ice cubes for your bloodless Bloody Mary, red wine or other beverages with bite.